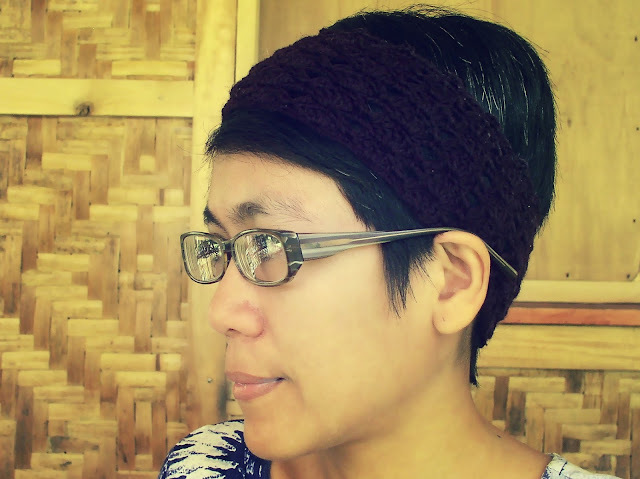 The hairband is made by simply working half-way through a hat pattern which starts at the base. You finish when you reach the desired width of the hairband. 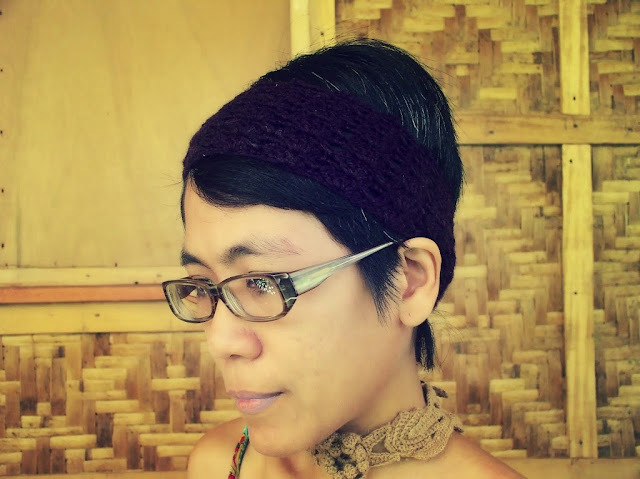 My hairband is worked in worsted weight yarn and a 2.5mm crochet hook. The resulting width of the hairband is 3 inches with 10 rounds. The finished hairband here shows 5 pattern repetitions, with the last 2 reps in decrease stitch to taper the hairband. 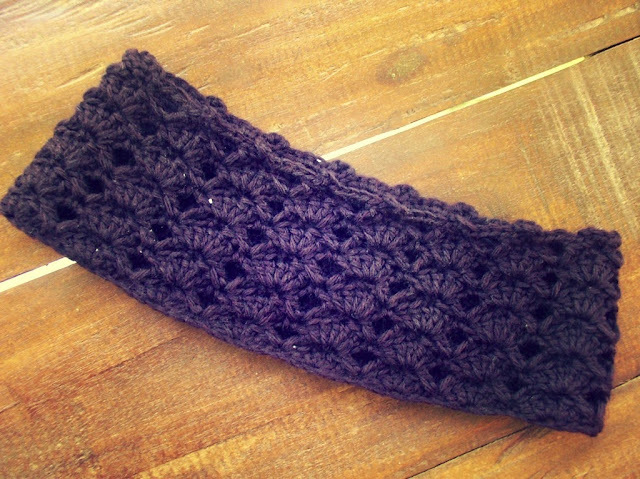 The upper edge of the hairband is crocheted with simple picots. 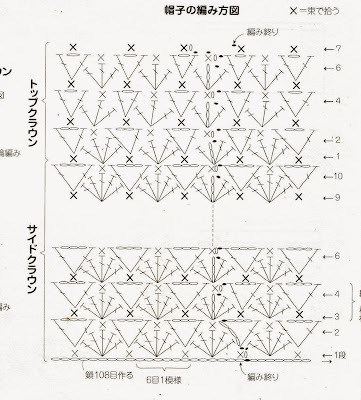 I include the hat pattern symbol chart above as reference. It is from a Japanese crochet magazine that I bought several years ago. The written instructions further below describe the modification of the hat pattern. You can use modify most hat patterns to make a wide hairband that fits your size. Sc in 2nd ch fr hook. Rnd 1: Skip 2 ch, 5 dc in next ch, skip 2 ch, sc in next ch, rep fr ending last rep with sl st in first sc to join. Rnd 2: Ch 3, sc in middle dc of 5-dc shell, in next sc make (dc, ch 3, dc), rep fr ending last rep with ch 3 and sl st in first sc to join. Rnd 3: Ch 3, 2 dc in same sc, sc in 3-ch sp, 5 dc in next sc, rep fr ending last rep with sc in last 3-ch sp, 2 dc in first sc, sl st in top of ch-3 to join. Rnd 4: Ch 1, sc in top of same ch-3, in next sc make (dc, ch 3, dc), sc in middle dc of 5-dc shell, in next sc make (dc, ch 3, dc), rep fr ending last rep with sl st in first sc to join. (This completes 2 rounds of the basic interlocking shell stitch pattern). Rnds 5-6: Rep rnds 3-4. Rnd 7: Ch 3, 1 dc in same sc, sc in 3-ch sp, 4 dc in next sc, rep fr ending last rep with sc in last 3-ch sp, 2 dc in first sc, sl st in top of ch-3 to join. Rnd 8: Ch 1, sc in top of same ch-3, in next sc make (dc, ch 2, dc), sc in 3rd dc of 4-dc shell, in next sc make (dc, ch 2, dc), rep fr ending last rep with sl st in first sc to join. Rep rnds 7-8 to complete the hairband. End the round with a simple picot edging, for example 3 sc, picot, 3 sc …etc. To make the second shell pattern decrease, you make a 3-dc shell (in the first round) and a 1-ch sp (in the next round). This will radically decrease the circumference of the piece to taper into the shape of a hat. To finish off, a closing round of sc in each ch-1 sp is made.